I have been playing the trumpet since 1990, and working professionally since 2001 in musical environments ranging from jazz orchestras to brass quintets to jazz combos to classical solos to rock bands to orchestras. While most of my professional work has been as a jazz / rock musician, I am a fine classical trumpeter as well, earning a Doctorate in (classical) Trumpet and continuing to present recitals. I can read music, transpose on sight, play by ear, and improvise. I own and play trumpets in Bb, C, Eb, piccolo, and F alto; flugelhorn; and cornet. I have also worked professionally as a saxophonist (soprano, alto, tenor, and baritone), clarinetist, and flutist (including alto flute). Doubling on woodwinds is unusual for a trumpeter, but it has gotten me a lot of work! This is a jazz / rock combo I led way back when I was a senior in high school! I tried to arrange some neat horn section charts for us, and I do mean "tried". I didn't know enough theory to understand what I was doing. But it was a fun experience! I was 17. Here we are playing for an event in Brentwood, TN. 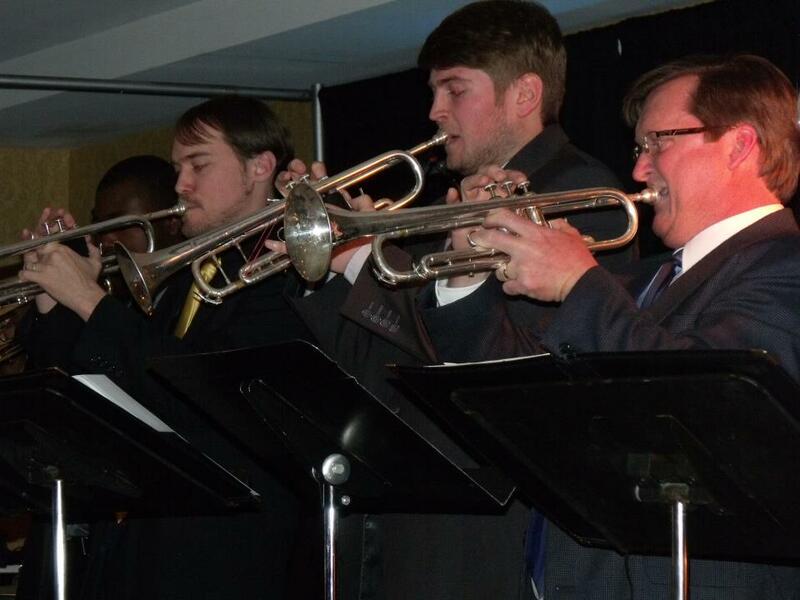 The University of Memphis Southern Comfort Jazz Orchestra trumpet section playing for the Jazz Educators Network. We are premiering one of my arrangements in New Orleans, LA. You can hear it ("So In Love") on the writing examples page! The wind ensemble trumpet section with our professor Dr. Spencer and Eric Ewazen, whose pieces we were recording in Memphis' Cannon Center. 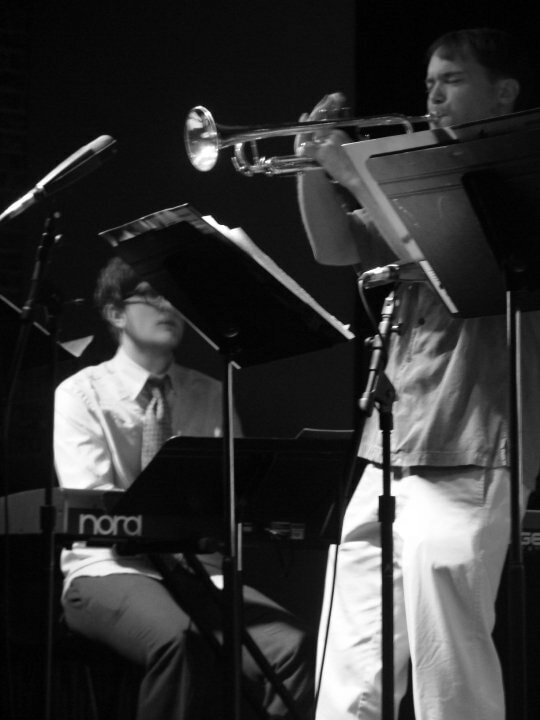 Here I am playing in a jazz combo for a fellow student's Master's recital. I don't remember who, because I played a ton of these! The Graduate Brass Quintet relaxes after playing a recital. This is one of the VERY few pictures of me in a tie. A Memphis Jazz Orchestra gig in white jackets for a Memphis church. Fancy! The Memphis Jazz Orchestra trumpet section in performance. 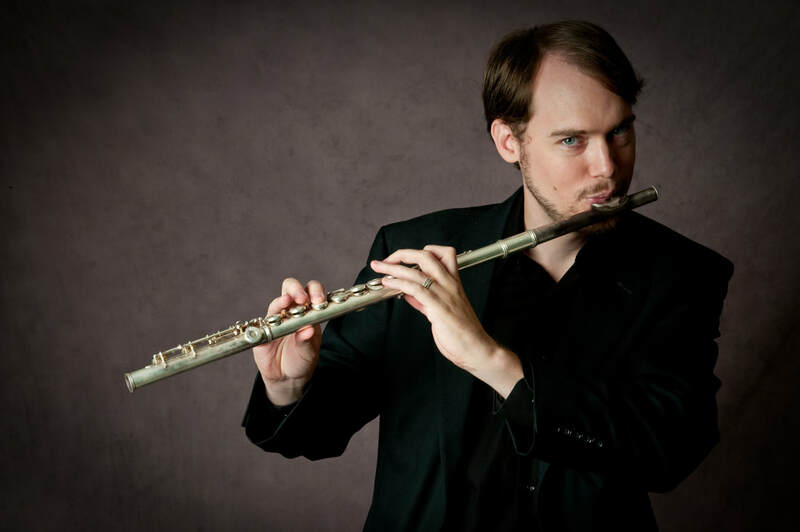 I don't have any good pictures of me playing the flute on a gig, so here's a posed one. Playing a solo with the New Memphis Hepcats, one of the area's premiere jazz ensembles. A photo from a live TV performance of the New Memphis Hepcats. This time I'm on baritone sax. The bandleader would often enlist me for a gig, then put me on whatever instrument he had the most trouble finding knowing I could handle reading the part! Making some noise with Freeworld, Memphis' top rock / jazz / jam band. My 8-piece pro band, the Flying Squid Battalion. The ridiculous name was chosen after a church who hosted one of our gigs wouldn't let us use "St. Paul and the Apostles". An old time swing band, posing with some statues after a gig. This is one of those rare gigs where I get to play cornet. Playing trumpet with Freeworld on stage at the Beale Street Music Festival. Freeworld's horn section from behind, with a nice shot of the landmark M bridge. I have switched to clarinet for the New Orleans tune. Taking a break from playing to sing backups. Dressed up as pirate / musketeer / member of Sgt. Pepper's Lonely Hearts Club Band a for a gig playing on a Canadian reality TV show. At Hard Rock Cafe. Note the clarinet on the stand at my feet, used for our New Orleans street band-type tunes. I wonder how many people have gotten on the Hard Rock stage and played clarinet? It can't be that many! Clarinet and sax at Blues City Cafe, Beale Street, Memphis. The Dodge City Jazz Orchestra in its second public performance, playing to a packed house in the historic Depot Theater. Due to our instrumentation, I'm actually playing trombone here. It's not an instrument I claim to play at a professional level, but I can get around it well enough. I play enough instruments that I rarely feel like I'm playing out of position, but here I am a little out of my comfort zone. I'm performing trombone and euphonium for Urinetown: The Musical - not an easy book for someone playing their fifth instrument! I practiced the part like mad and actually sounded pretty good at the gig. I felt like the starting pitcher who gets sent out to play left field when someone gets hurt in the 15th inning. 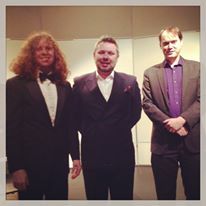 The Dodge City Community College music department faculty after our faculty recital. We did several, and I presented the Tomasi concerto, Bozza's Rustiques, the Kennan sonata, the Haydn concerto, Vizzutti Cascades, Tartini, and Clifford Brown's Joy Spring. But not all at the same recital.